Pictures Martin Taylor has taken with this camera. Let me come clean from the outset; the Yashica Electro GS is probably the favorite rangefinder I own. I would say, "it's not a Leica but ..." but what would I know having never used a Leica myself? I love it because it is fast, quiet, cheap, reliable, understated, has great image quality, is easy to use and is built like a tank. The Electro seems to be a direct competitor and contemporary to the second generation Canonet 17. Among junk camera / 70's rangefinder aficionados, the Canonet 17, especially in it's GIII form, is something of the holy grail. Unfortunately, anyone with even a superficial knowledge of 70's rangefinders now knows this and is looking for the Canonet 17 on eb ay and at photography dealers everywhere which makes it hard to find a good working example for under $100. 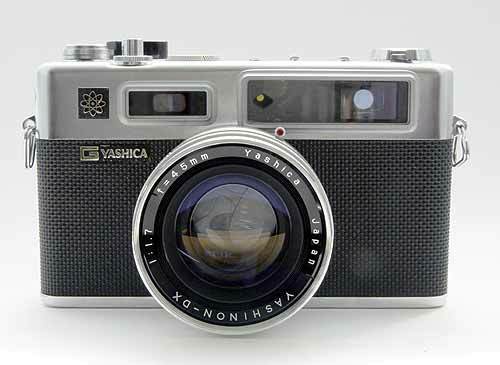 Compare this with the under-appreciated Yashica Electro which go for as little as $10 on eBay. I bought my own example of the GS from eBay for $30.73 including P&P and this price also included the two auxiliary lenses and the matching viewfinder. Reliability - I have not been able to get a Canonet 17 for a reasonable price, however, I have bought less desirable Canonets like the 28,25 and 19. The 25 and 19 share most of the 17's components I believe, including their shutter. The Canonet shutter seems to be very vulnerable to seizing after long periods of inactivity. This isn't a terminal problem but it does require a good number of hours tearing down the Canonet's front and back lens elements to expose and clean the shutter and aperture. This is far from a simple procedure. The Electro's shutter is electronically controlled rather than mechanically and seems to be a much more robust design. Not that the Electro stands the test of time without it's own faults. My example seems typical of most you will come across; it was neglected and stored for years with an dead battery in it. Due to the battery's substantial size the amount of acid it seems to be able to leek is pretty substantial too. Enough that the battery cap fuses in place requiring the removal of the bottom plate a bath of white vinegar. However, once the electronics are cleaned up the Electro will typically fire up with out further attention. 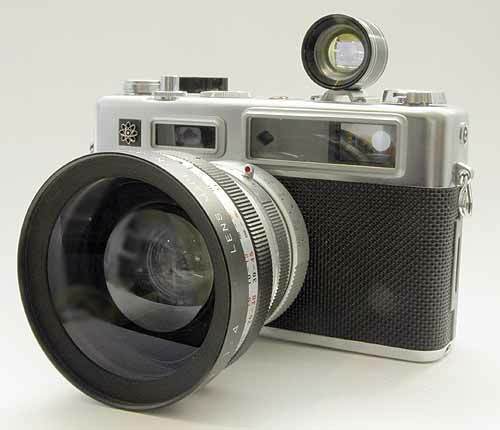 Although the original, mercury batteries for both the Canonet and Electro have been outlawed in the US the Electro is much more tolerant of modern replacements. No short lived hearing aid batteries for the Electro. Focusing - The Canonet's viewfinder is nice and bright but the Electro's is better to my eye. Both have parallax compensation but, in low light, the Electro is easier to focus. And low light is what these rangefinders are about with their fast f1.7 lenses. I find the Electro's viewfinder so bright it is much easier to focus than any of my SLR's. With it's fast glass and chunky body the Electro has little size or weight advantage over a SLR but it's fast lens, easy focusing and quiet shutter make it a great camera for unobtrusive candids and street photography. Speaking of street photography, the viewfinder may lack the typical analogue needle of an aperture priority camera to report shutter speed, instead replacing it with over and under Leds but these Leds are repeated on the top plate of the camera. I believe these were placed on the top of the camera for use when the camera was mounted on a tripod but they are also useful when you've pre-focused and are shooting from the hip on the street. I'm sure you could find an unfashionable, chrome Electro on eBay for $20 without much work. Replace the foam seals, clean up and corrosion and put in a new battery and film and you've got a rangefinder work horse for very little outlay. Just don't tell too many people or the Electro may start to command Canonet 17 prices! Just bought a Yashica Electro 35 GSN off of ebay for $35 and I can't wait for it to arrive. Nice site but grammar needs cleaning up. Where can I buy a battery or some kind of adapter for the GS Electro? Bought an Electro 35 GSN on ebay for $17.50 Didn't know it all, but it looked brand new. Forty years as a photographer and I consider this one of my favorite cameras. Bit of a learning curve to figure it all out, but discovered Yashica Guy, got the light seal kit, got the right battery, cleaned it up, and what a sweetheart. Beautiful lens, does a lovely job with colors, and rangefinder is quite easy to use in low light. Fast lens. I completely agree with your glowing assesment of the Yashica GS/TN series. Smooth, quiet operation with fast, razor sharp optics. I had both the GSN(chrome) and GTN(black) models. Lost them both to a psycho roommate (shades of Single White Female O_O) and have missed them ever since. I shoot with a Konica Hexar AF now(the classic Black model; yeah guess that makes me a Cultist, where're my Black Robes LOL). Now your site has got me haunting(gotta find another use for those robes after all) Ebay for another Electro. I guess there's prescience in your comments. The electros seem to be getting much more sought after these days. Have been foraging on ebay but even the ones with the shady invitations not to buy 'seems to be working / I'm not an expert' etc. are getting heavily bid on (at least in the UK). I have recently (today) picked up a Minolta Hi-Matic 11, which seems sweet, though hefty, so I guess that'll be my entree into the world of 70's rangefinders, for the time being anyway. I second Paul's observations -- I bought a Yashica Electro GSN on ebay, replaced the light seals with some sticky foam I bought at Walmart, got the Yashica Guy battery adapter, and have put Velvia and Provia through it, and the images are real attention grabbers. The lens is very, very sharp. I put the camera on a sandbag, and the crips images sometimes have the '3D' look of some Leicas... use a filter of some kinds. I use ND and Moose, lose a couple of stops, but I'm having a lot of fun with this 'cheap' camera with the amazing lens. Can't complain. Inspired me to use it more, just haven't gotten around to scanning the slides yet. Pick up one or more on ebay, fix it up with seals and a battery.. so cheap, keep the one that takes the best pics and get rid of any that need work, they're so inexpensive, so much bang for the buck, and rangefinder fun. 1969.And "YAshikor aux Telephoto 1:4 - and "Yashikor Aux.Wide Angle 1.4-Y002 Lens Made in JAPAn.And "Tele-Wide Finder -Japan. The best place to sell this camera is on eBay but you should know that the Electro rangefinders are not fetching much money these days. cerco il modo di riparare esposimetro kiev4. I agree in 100%! I bought Yashica GSN and one of the first electro 35 and have so much fun with it! Actually I am amazed with the picture quality and sharpness! Fantastic camera and absolutely underestimated! My favourite one! I finally did get another GSN and am loving using it. I picked up a GSN on eBay for a song. What a fantastic piece of equipment this is! What else of that era had a shutter that could go to 30 seconds for night photography? While it's a bit of a pain there's no manual override possible (without altering the film speed to fake it out) I've rarely seen that amazing light meter make a mistake. I love the lustrous tonalities, especially shooting black and white. Isn't it funny - get a 1960s camera and you feel you MUST shoot B&W. It's like stepping back in time. These babies produce such excellent shots it's no wonder I haven't jumped to digital yet. That and the high cost of getting anything really amazing in the digital world. Hmmm... do I buy A Nikon D80, buy 40 Yashica GSN's, or one GSN and keep > $800 in my pocket. Which is more fun? I also got a Optically and Cosmetically Mint GT that is going off for repairs to the "Pad of Death"